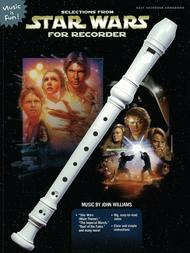 Selections from Star Wars for Recorder (Book Only). Composed by John Williams. For Recorder. Recorder Collection. Easy Recorder Songbook. Movie. Softcover. 24 pages. Alfred Music #25935. Published by Alfred Music (HL.322024).ISBN 0739042459. Movie. 9x12 inches.Written for easy recorder, this book features big, easy-to-read notes, a beginner's guide to playing the recorder, and a clear, simple introduction to reading music. Seven of the most well-known Star Wars themes and melodies are included. Titles: Star Wars (Main Theme) • May the Force Be with You (“The Force Theme”) • The Imperial March (“Darth Vader's Theme”) • Princess Leia's Theme • Duel of the Fates • Yoda's Theme • The Throne Room (and End Title).